Situated on the ground floor of North Grosvenor, the Infrared Remote Sensing Laboratory is where instruments are prepared and calibrated prior to ship-board deployment, and re-calibrated and refurbished after periods at sea. The primary instruments are the Marine-Atmospheric Emitted Radiance Interferometers (M-AERI’s) which have been deployed on over 50 cruises to assess the uncertainties in the skin Sea-Surface Temperature (SST) retrievals from a number of radiometers on earth-observation satellites. The M-AERI’s are Fourier-Transform Infrared interferometers that produce spectra in the wavelength range of 3 to 18 μm, that is it spans the most important range of infrared emission from the ocean and atmosphere. 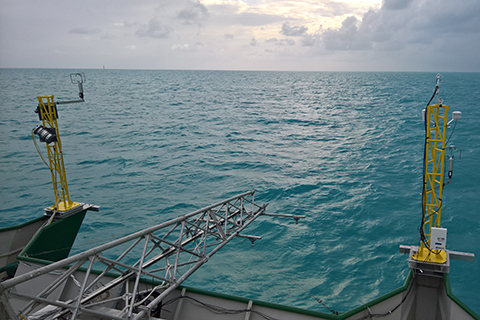 The M-AERI’s have two internal blackbodies for calibration during field deployments and the accuracy of the internal calibration is determined before and after use at sea using SI-traceable calibration facilities in the laboratory. The laboratory calibration water-bath black-body reference, constructed to a design of the National Institutes of Standard and Technology (NIST), has been characterized by the NIST Transfer Radiometer several times, and has been used in three international infrared calibration workshops at RSMAS. The emission spectra measured by the M-AERI’s can be used to study a range of oceanic and atmospheric processes. Other sea-going instruments we use include ISAR’s (Infrared SST Autonomous Radiometer’s) which are routinely deployed on commercial ships crossing the Pacific Ocean, and their skin SST measurements are also used to assess the uncertainties in satellite measurements. Alongside the M-AERI’s a large selection of meteorological sensors, including a microwave radiometer to measure atmospheric moisture, all-sky cameras, and radiosondes stations to measure profiles of temperature and humidity, are deployed on ships; all are maintained in the Infrared Remote Sensing Laboratory.